Community Impact: The German Embassy in Washington, DC has announced its hosting of a festive re-dedication ceremony onsite at the German-American Friendship Garden, on Friday, April 11th, 2014 at 3:00 PM. The Friendship Garden is situated at one of Washington’s finest addresses, at the National Mall on the Washington Monument grounds entry on 1600 Constitution Avenue, NW.The German Embassy Friendship Garden re-dedication activities will include an address by Ambassador Dr. Peter Ammon, Embassy of the Federal Republic of Germany, and a welcome address of Robert Vogel, Superintendent of the National Mall & Memorial Parks of the National Park Service, followed by a presentation of “German-American Friendship Award.”Additionally, the National anthem of the Federal Republic of Germany and National anthem of the United States of America will presented by the Mc Lean Symphonic Orchestra (an exchange program with Germany). Dr. Ammon will highlight the Friendship Garden restoration, renewal and re-dedication, and acknowledge the participating volunteer donors on hand at the event, including Project EverGreen, a non-profit green industry foundation, and its DC area-based contractor volunteer partner, Ruppert Nurseries, and participants from Oehme Van Sweden Landscape Architects. Coincidentally, Ruppert Nurseries and Oehme Van Sweden were reunited on the recent restoration project, years after participating in the original Friendship Garden design and construction. Last November 12th through 14th, as part of an agreement in principle with the National Park Service, Project EverGreen coordinated with National Mall and Memorial Parks officials, The German Embassy, Ruppert Nurseries and Oehme Van Sweden Landscape Architects, to jointly donate the planning, nursery stock, crews and equipment needed to enable the pro bono landscaping renewal installation of the German-American Friendship Garden. The installation was originally scheduled to take place in time for the annual October 6th anniversary commemoration ceremony of the of the first organized German-American settlement in the United States in Germantown, Pennsylvania, a Philadelphia suburb still in existence today. However, that celebratory event was prevented by the US government closing on that very date, resulting in the re-dedication event being moved to April 11th of this year. The new garden plantings included varieties of over 2,000 high-value shrubs, plants and trees, native to both countries, provided by a contribution by the German Embassy. The installation was based on a design by Oehme van Sweden Landscape Architecture, who also sourced the nursery stock to be planted and supported Ruppert Nurseries’ restoration in an advisory capacity. “Existing plants were reshaped, an irrigation system installed, and a large variety of new flowers and bushes planted,” according to Lisa Delplace of Oehme van Sweden. 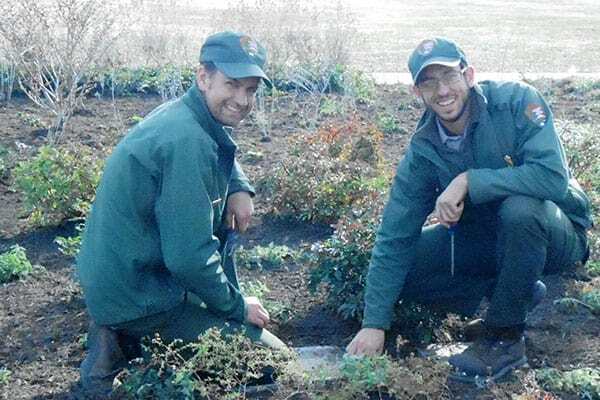 Late last September, Robin Nixon, Chief of Partnerships at the National Mall and Memorial Parks, invited Project Evergreen to help complete the German-American Friendship Garden plantings renovation within a tight few days’ schedule. Cindy Code, Project Evergreen’s executive director, reached out to Chris Davitt, president of Ruppert Companies, a Maryland-based contractor volunteer. Over a weekend, Chris arranged with Jeff Gowen, National Mall landscape architect, to donate crew labor, equipment and organic material to insure meeting the planting schedule and adhering to the design plans.